The article defines the nutritional categories and provides some information on how to make better dietary choices. 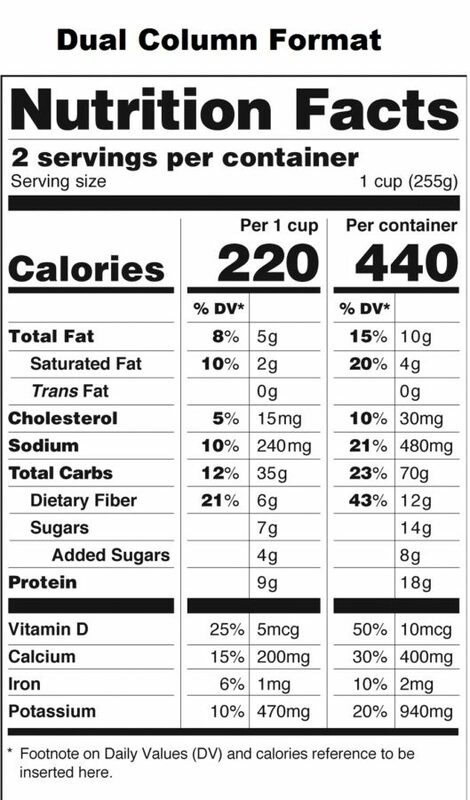 The key to using nutrition labels for better health is understanding the regulations guiding the numbers – and performing a little math. Portion size is the decryption key to demystifying the entire nutrition label. All the other information flows from there. What’s considered a reasonable portion? You may have faced the following types of situations which can cause confusion in answering that question. Restaurants serving enough food on a plate to feed a family of four – but it’s all yours. Candy bars increasing pieces and amounts. A snack bag two or three times the size of the ones we used to toss into a lunch bag. So we think we know what a portion is. Except maybe we don’t. What is a reasonable serving size and do nutrition labels disguise it? To be fair, the label doesn’t hide the portion size as much as it relies on you to read carefully and calculate how much you’re eating. Here’s a typical example. You pull into the parking lot of a convenience store and dash in for a salty snack. You snap up a bag of pretzels. It’s a smaller bag than you buy for your family, so you’re confident it’s a portion since the bag is much smaller. You’ve made a good choice, right? Depending on the brand, a serving size of miniature pretzels is about 15 pieces – around 100 calories. But is your snack bag a 100-calorie bag? Chances are it contains three servings which is 45 pretzels and 300 calories. In this example, if you plan on eating the whole bag, you’ll have to multiple all the other numbers on the label by three since since the values listed apply to one serving only. To help you find the serving size without a magnifying glass, the new label now lists the number of servings per container first, with the serving size beneath it in larger, bold type. But that’s not the only change. In addition to placement, there are some specific modifications in the guidelines that establish the serving sizes on the new label. By law the serving size suggested is based on the amount of food and drink people actually consume, not on the amount they should be eating. It will come as no surprise that people have changed their eating habits since the original guidelines were established in 1993. One serving of ice used to be 1/2 cup. Under the new guidelines it will be 2/3. One serving of soda used to be 8 ounces. The new guidelines will set it as 12 ounces. A 15-ounce can of soup will no longer be considered two servings. It will be labeled as one since most people eat the entire can for one meal. A pint of ice cream. It’s always a good idea to keep an eye on the number of calories you eat in a day. If you are trying to maintain a 2000 calorie per day diet, then knowing how many calories exist in a serving is important. Let’s say a package contains four, one-half cup servings and each portion is 50 calories. If you eat the whole package, you’ve suddenly consumed 10% of your daily calories all at once. The number of calories is now very prominent in the new label. It’s still listed near the top, but is bigger and in bold type. The next fact contained on a nutrition label is total fat content. Most of us know we don’t need as much fat in our diet as we get, especially saturated fat. But some fat in our diet is necessary. Put into context, if the dietary fat number is 5% or less, it means the product is fairly low in fat content. If it’s 20% or more it may be best to leave the product on the shelf. You will no longer see the number of calories from fat on the new label. Current research suggests the type of fat ingested is more important than the amount. You will still see the saturated and trans fat grams, both of which you should limit in your diet. The next item on the new nutrition label covers cholesterol content, followed by sodium. This is the reverse of older label. There may be no way to avoid all cholesterol. But we can cut back on the “bad” cholesterol (LDL or low-density lipoprotein cholesterol). Packaged foods, however, don’t differentiate between the two. If your medical professional has told you to reduce your cholesterol intake, always take a look at the number on the nutrition label. A good approach is determining the percentage of cholesterol the packaged food contains based on how much you plan on eating. Just like with fat, if the number is less than 5%, it’s not much. If it’s more than 20%, consider a different food selection. Most canned foods are high in salt. And although fresh, seasonal, and organic foods are better in quality and taste, many families have to use canned foods to stretch their food budgets. Outside of specific recommendations from your doctor, keep your sodium intake under 2300 milligrams per day. In a ground-breaking move, the FDA has drafted voluntary sodium targets. Although voluntary, restaurants and food manufacturers may choose to lower the amount of salt in certain foods to meet these targets, making salt easier to manage. You’ll be able to choose how much salt you want in your food. Ingesting less salt can reduce the risk of heart disease and stroke. Carbohydrates – low carbs, net carbs, too many carbs? I don’t need to tell you the near obsession Western culture has with carbohydrates. More often than not, individuals make every attempt to reduce them in their diets. The new nutrition label provides more information about carbohydrates than it has in the past. 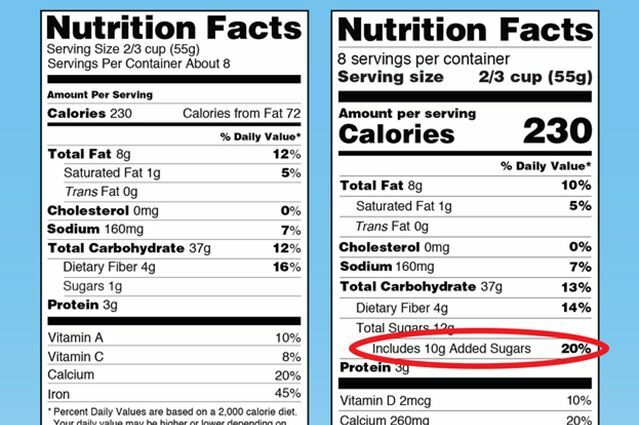 It now includes added sugars, a vital piece of information that was omitted on the old label. Consuming added sugars increases calories that can put on weight without providing a lot of nutritional value. Added sugars also quickly raise your blood sugar, which is a particular concern for individuals who have diabetes. If you’re calculating total carbs, you need three numbers from the nutrition label. The total carbohydrate number reveals how many grams of carbohydrates are in one serving. If you are eating more than one serving, you’ll need to multiply the grams of carbohydrates accordingly. Keep in mind that the itemized numbers on the label may not add up to the total because starch is not listed. If you are netting your carbs, you’ll have to perform a little more math. Subtract sugars, added sugars and dietary fiber from the total number of carb grams to get your net carbs. You can still gain weight on a low-carb diet if you allow your total calorie count to go unchecked. Net carb practices don’t necessarily pay attention to calories. You may be hitting your intended carbohydrate number, but ingesting more calories. You may also be eating more starch than you intend, which is hard to manage since it’s not listed on the nutrition label. Try balancing your carbs within a modest daily caloric intake. Even though dietary fiber is included as part of the carbohydrate count, demystifying the role of fiber in your diet can improve your health. Foods with higher fiber make you feel full for longer periods of time because it leaves your system slowly. So, you may eat less. When eaten in large amounts, fiber blocks absorption of carbohydrates (and other nutrients, including protein and fat), reducing the total number of calories absorbed by the body. Since fiber leaves your stomach slowly, you won’t experience large spikes in blood glucose. Sugary snacks, like candy bars, digest quickly creating considerable dips in blood glucose. That’s why shortly after you eat food high in sugar you may suddenly feel tired a hour or so later. Sugar is another challenging issue to manage. With the new label, you’ll get a better idea of how much you’re consuming. However, you may decide to select a sugar-free version of the same food. This creates a different dilemma. Sugar-free food may not be as calorie-friendly as you believe. Sugar-free products may not have a lot of sugar, but they can still be loaded with calories. Why? Because they may contain more fat. Compare the regular version to the sugar-free version. You may be surprised to note the number of calories is about the same. Protein information is located in the same spot on the new FDA nutrition fact label as it is on the old one. Protein is essential for maintaining muscle mass. Our body also uses it to make any glucose we aren’t getting from carbohydrates. When purchasing food, read nutrition labels and choose some products for protein. But consider the fat grams when doing so. Many foods rich in protein are also high in saturated fat. Dairy products considered good for protein may also contain high amounts of trans fat. 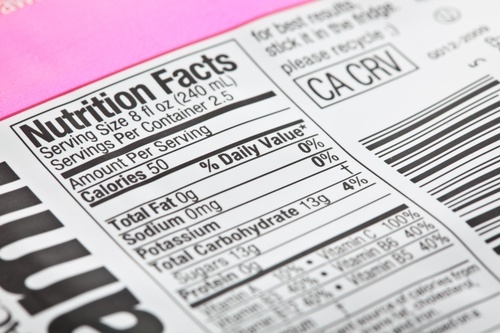 Food labels can help you make informed decisions. If you don’t eat much protein, keep an eye on it. You don’t want to end up losing muscle mass. The National Academy of Sciences recommends we get ten to thirty-five percent of our calories from protein. Information on vitamins and minerals is sparse on nutrition labels. The daily value of vitamins A and C, calcium, and iron were required on the old label, although specific amounts were not listed. The FDA requires the new label to list vitamin D, calcium, iron, and potassium. Vitamin D and potassium are included because if you have insufficient quantities of them in your diet, it can increase your risk of chronic disease. Vitamin D also contributes to better bone health. Potassium helps reduce high blood pressure. In the new label, vitamins and minerals must also show the amounts of each in the food. Vitamins A and C are no longer listed since deficiencies in those vitamins is now rare. When reviewing a food label, you may not pay much attention to the column labeled, “% Daily Value.” These numbers tell you how much a particular nutrient contributes to your daily diet if you consume 2000 calories per day. To put those numbers into context, any nutrient that shows a daily value of 5% or less means the food provides very little of that nutrient. If it lists an amount of 20% or more, then that food may be a reasonable source of that nutrient. The footnote defining the percent daily value is revised on the new FDA label. When will you see the new FDA label on packages? Many manufacturers are already using the new label. Most will have it in place by no later than July 2018. Smaller companies have an extra year to comply. If you’re wondering if imported foods have to meet the new labeling requirements, the answer is yes. 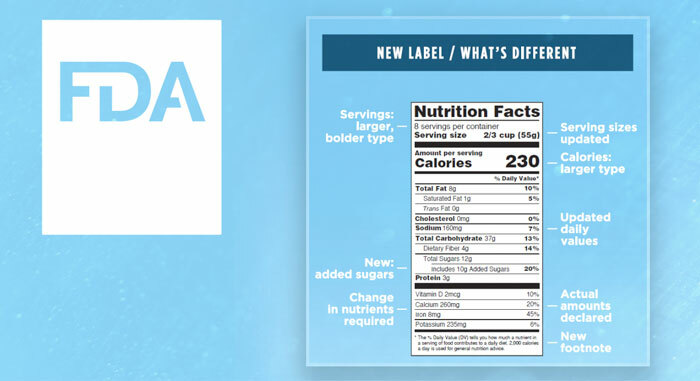 Demystifying the new FDA nutrition label so you know what it really says enables you to make informed decisions about what you’re eating. To your better health. And thanks for stopping by today. Becoming a nutritionist or registered dietitian may be an ideal career for you. You can begin today! Anatomy and physiology, chemistry and microbiology are only some of the courses you’ll need to become a registered dietitian. Many are similar to what pre-med students need to become medical doctors. The Apprentice Doctor® Academy has developed and perfected an Online Course for Future Doctors and other medical professionals to assist them towards fulfilling their dreams of entering the allied health industry. For Future Doctors Foundation Medical Online Course with accompanying Medical Kit has helped launch the career of thousands of healthcare professionals! Prefer providing care using hands-on skills? These inexpensive kits will help you develop. The Apprentice Doctor® Phlebotomy Course and Kit is a resource that will teach you how to confidently perform phlebotomy procedures in a couple of hours! If you want to perfect that skill, why not learn how to perform venipuncture procedures now? The Apprentice Doctor® Suturing Course and Kit is a resource that will teach you how to suture wounds in a couple of hours! If you think you may be drawn to direct-patient care, why not learn suturing techniques now? For other products, including affordable scrubs, visit our shop. 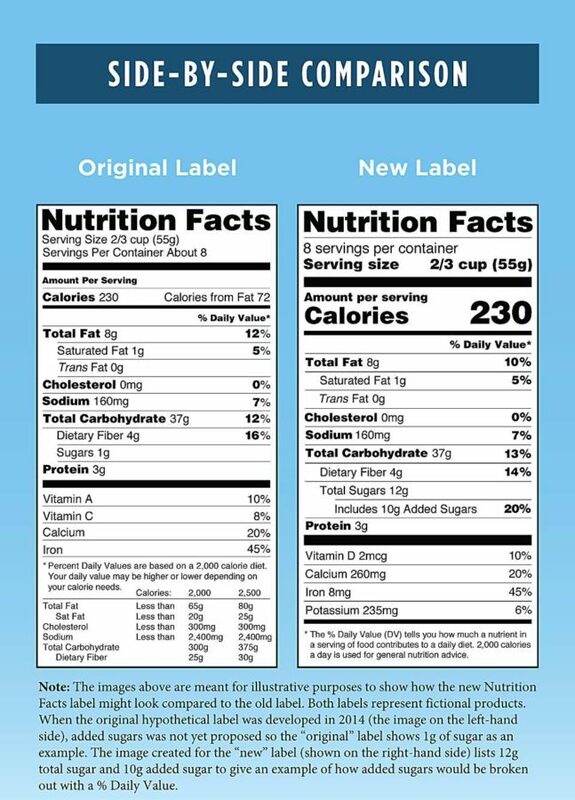 Photo Source: Photos provided by the Food and Drug Administration showing proposed new food nutrition facts labels. (Food and Drug Administration via AP).